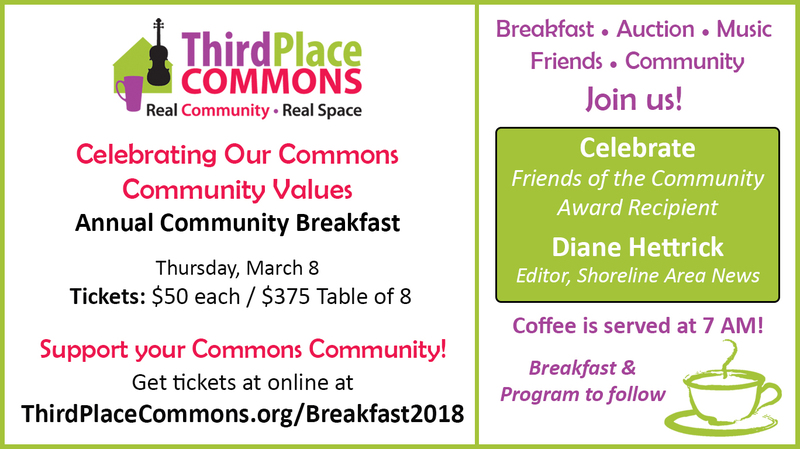 Third Place Commons invites you their annual community breakfast on Thursday, March 8th when Shoreline Area News Editor Diane Hettrick will be honored. ​This lively, fast-paced event is the Commons’ biggest fundraiser of the year and is the perfect time to join with friends, colleagues, and neighbors in showing your support for the extraordinary community that is fostered at the Commons and at the Lake Forest Park Farmers Market. One of the high points of the breakfast each year is the presentation of the Friends of the Community Award, which has previously been awarded to the Lake Forest Park Rotary, Friends of the LFP Library, the Shoreline / LFP Senior Center, and the LFP Youth Council and Shorecrest Interact Club, among others. In 2017, Shorecrest High School arts leaders Vince Caruso (music chair) and Laura King (art chair) were honored. Given this year’s focus on their “Commons Community Values,” the Third Place Commons Board felt that that there was no better way to celebrate these values than by honoring this year’s Friends of the Community Award recipient Diane Hettrick. If you’re reading this, then you know that Diane has given tirelessly to the local community for many years as the daily editor of the Shoreline Area News. Thanks to her efforts, the Shoreline Area News has become an invaluable resource to local individuals, organizations, businesses, and civic partners throughout Shoreline, Lake Forest Park, and well beyond. Please join your Commons community on March 8th in celebrating Diane’s tremendous contributions to our shared community! Per tradition, the wonderful Milner Family Fiddles will be on-hand to serve up a warm, musical welcome to one and all. Longtime local favorites, the Milners play regularly at the Commons and elsewhere in a rotating roster of family members, led by Glen Milner. Included in the line-up for our event will be Alisa Milner and her husband Ian McFeron, whom you may remember from his moving speech at last year’s breakfast. Third Place Commons is a community-supported 501(c)3 nonprofit organization dedicated to fostering real community in real space, and this is your chance to show your support for that vital community. The event will also feature a live auction featuring some very fun and unexpected items. Visit the event page to learn more or get your tickets now for the big event!